The Creation of the First USA Public High School Baroque Ensemble . . . The “DHS Symphony Orchestra” an auditioned full symphonic orchestra including woodwind, brass, percussion, and stringed instruments, at 75 students-making a total of 130 students between two groups. The growth at the High School contributed to the growth at the elementary school and junior high level music programs and the positive continuation rate of orchestra students from 7th grade to 12th grade. As the two orchestras continued to grow there came the need for a third orchestral ensemble. Like a Jazz band for a band program or a Madrigal Choir for a choral program, the DHS Baroque Ensemble became a natural extension of the DHS Orchestra Program as well as the second audition orchestra at DHS. This group provides students the opportunity to focus on Baroque music, Baroque performance practices, and master technique skills on period style instruments in a smaller ensemble. The period style instruments allow the unique style of the era to be further developed making the overall performance experience more historically accurate and engaging for the student musicians. The DHSBE also allows orchestral students the ability to access a rich and diverse wealth of orchestral literature unique to the development of music as we know it today, which was not possible within the organization of the orchestra program prior to the creation of the group. Without the support of the school administration, district administrators, and the school board this new course would not have been possible. The district supported the course by passing the course proposal unanimously and allowing the DHS Music Department to implement the DHS Baroque Ensemble into the DHS Orchestra Program. Unfortunately, there were no grants or monetary support from the district beyond teacher FTE. 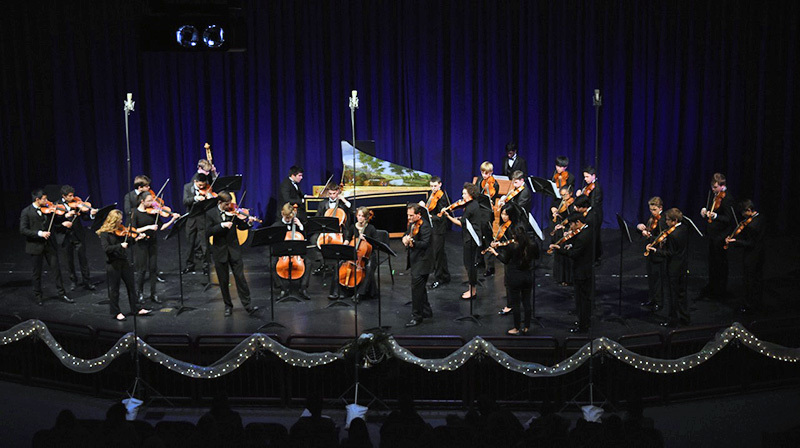 The money for converting all the instruments, purchasing the Baroque Bows, adding gut strings to all the instruments, and purchasing new music specifically for this ensemble was raised and donated by our nonprofit orchestra association the Davis Schools Orchestra Music Association or (DSOMA). The money came from the parents and the many community donations made to DSOMA over the years. DSOMA financially allowed this new group to start off well equipped with period style instruments including a professional level John Phillips (1991) Harpsichord and style appropriate music. The orchestra students earned the creation of this course and sealed the commitment of the School District with their continuously climbing enrollment numbers, commitment to the program, and love for playing orchestral music. It should be noted that the DHSBE has received vital support from the UCD Music department and was inspired by UCD Baroque Ensemble directors Phebe Craig and Michael Sand, musical mentors of Angelo Moreno. Phebe Craig generously shares her harpsichord expertise by coming to DHS to coach the harpsichord students individually and within the group rehearsal. The group is also privileged to have Richard Webb, former member of the Academy of Ancient Music, as a continuo coach for lower strings. Richard is also a wonderful artistic consultant and resource as well as group dynamics coach. American Bach Soloists member Katherine Heater. Most notably in 2014 the DHSBE was honored to have Rachel Barton Pine as guest soloist and looks forward to her future visit in May 2017. 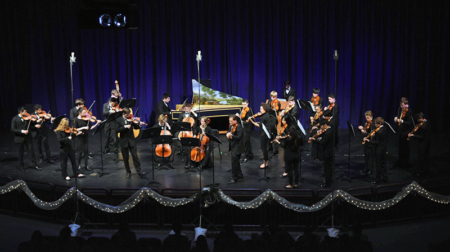 The DHS Baroque Ensemble made its debut on the main stage at the 2014 Berkeley Baroque Festival and is proud and honored to have been invited back to the main stage for the 2016 and 2018 Festivals. In June of 2017 the DHSBE will have accomplished its second major international tour, the first one being in 2014 to Italy for 10 days. The 14-day 2017 tour started in Vienna and ended in Italy. The group performed in historically significant Baroque Cathedrals major cities including Vienna, Eisenstadt, Salzburg, Wattens, Innsbruck, Venice, Padua, Cremona, Lucca, Montecatini, Florence, and Rome.